Soak the dried black and white fungi in water until soft. Cut off hard stalks. Discard the water. Bring water to a boil. Add 2 to 3 slices of ginger and some slab sugar. Pour in the fungi and boil for 3 minutes. Rinse with cold drinking water and drain. Heat wok with oil. 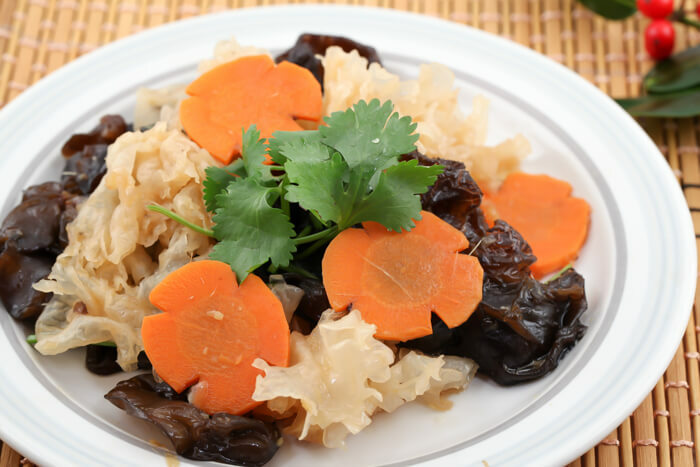 Add grated ginger, carrot slices and fungi to stir fry for a while. Turn to low heat. Add seasonings and some water to cook for 5 minutes. Add sesame oil before serving to enhance aroma if preferred.